Ape and Drews West Coast shenanigans! Re: Ape and Drews West Coast shenanigans! 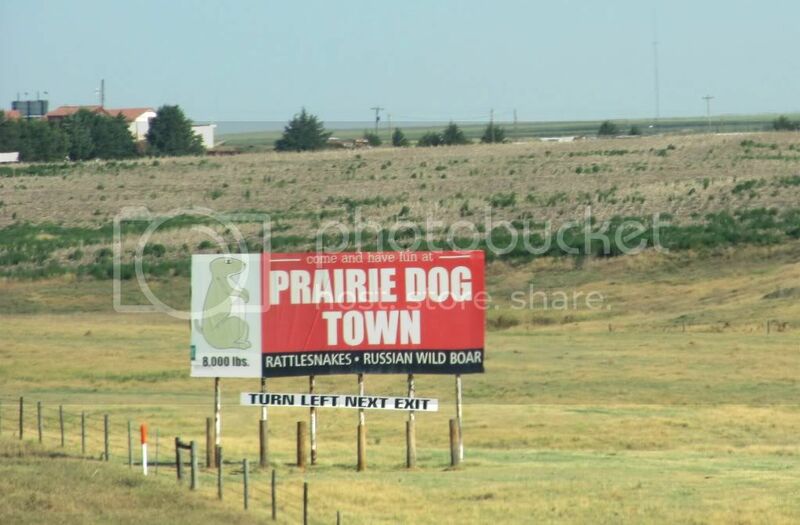 Don't forget about the world's largest prairie dog. Kansas has that going for them too. You mean this one? That's one B-I-G sumbitch, lemme tell ya….8000 pounds of ground squirrel will keep a redneck family of 12 fed all winter long!!! corn corn corn what's that smell? Ok well that's i-80, but I think it applies to I-70 also. Yeah.. Been there, done that. I didn't care to do it again. Wanted to stay fresh so I could get to the coast this time. Though if we were going a totally new way I wouldn't mind doing it on the bike. THom and I crossed Kansas via I-70 back in 2003 and swore we'd never do it again. It was pure misery. We came back across Nebraska via I-80. It wasn't much better. I crossed the plains through South Dakota via I-90 in 2010 and it was still flat and straight, but I held triple digits most of the way, so that kinda made it easy. In 2012 we trailered our bikes driving round-the-clock to Denver, unloaded and immediately rode to the top of Pikes Peak and set out on a 4000-mile 10-day loop through the SW/Western States, up the PCH, and hitting a dozen Nat'l Parks along the way. I'm not sure if trailering helped us physically due to our limited sleep and some of the stress involved, but it did save our motorcycle resources and gained us a couple extra travel days that we would not have normally had. Our tow rig was vastly underpowered for the three bikes and trailer that we were towing though, and it cost us a small fortune in fuel. 22 hours each way, and 10mpg average. Being able to tow two bikes and still get 26mpg, is pretty impressive in my book. When Bryn and I went to CO a couple of years ago, we hauled my 14' tandem box trailer carrying the VStrom, his Dakar, and a spare DRZ400 with all our gear and camping stuff with my 4.6L V8 F150 X-Cab and got about 15 MPG while averaging 80-85 thru KS and eastern CO. Not horrible under the circumstances. And I'm with TTTom and Thom--I wouldn't ever WANT to ride across the flat expanses of the midwest. Here is the link for the album I have created with images from the trip. I think Drew is going to upload his own pictures into his account. Prairie dog, rattlesnakes, and Russian wild boar. Sounds like a fun town to me! ?